With Grandma's favorite homemade angel food cake recipes, you'll be able to make light and fluffy cakes with a divine taste. It's thought by some food historians that these festive white cakes originated with thrifty Pennsylvania Dutch cooks as a practical means to use leftover egg whites. 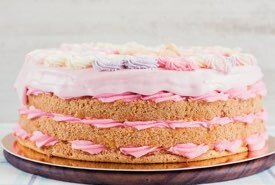 In the 1880s, American cookbooks began to feature angel cake along with similar cakes such as the snowdrift cake, and the silver cake. You'll love making them. You can now purchase pasteurized egg whites in most food stores; it's easier and cheaper than separating whole eggs solely for the whites. Ingredients: Whites of 6 eggs, 3/4 cup fruit sugar, 1/2 cup flour, 2-1/4 teaspoons cornstarch, 3/4 teaspoon cream of tartar, 1/6 teaspoon salt, 1/2 teaspoon vanilla, 1/2 teaspoon lemon juice. 1. Sift the fruit sugar 5 times. 2. Sift four, cream of tartar, cornstarch, and salt 5 times. 3. Beat whites of eggs until foamy, add sugar slowly, continue beating. 4. Add flavoring, then lightly fold in the flour, sifting it gradually over the mixture. 5 Turn into unbuttered tube pan. 6 Bake in slow oven 1/2 hour (275°F to 300°F). Place in center of oven. The oven door should not be opened during first 20 minutes. 7. When done invert pan on cake-rack. Let cake hang in the pan until cold. Sift flour, cream of tartar, sugar, and salt together 4 or 5 times. Beat the egg whites in a large dish to a stiff froth. Add the sifted flour, etc., gradually, beating all the time. Have angel food pan ready — do not let the cake stand a minute after it is mixed! Bake about 45 minutes at 300°F, or just until done, and do not open the oven door to check until the cake has been in at least 15 minutes. Add 2 teaspoons rose water to batter, if desired. 1. Beat egg whites with flat whip. 2. Add salt and cream of tartar when egg whites are frothy. 3. Continue beating until egg whites will stand in peaks when whip is pulled out. 4 Gradually beat in 1 cup sugar that has been sifted twice. 6. Sift flour once before measuring. 7. Fold in flour gradually which has been sifted 3 times with remaining 1/2 cup sugar. 8. Pour into dry ungreased pan. Cut through batter with a knife to break any large air bubbles in the batter. 9. Bake and after removing from oven, invert pan over two or three tumblers until cake is entirely cold. Having cake suspended thus, it will cool at full stretch and not fall back on itself. Baking temperature: 325°F, slow moderate oven. Size of pan: Deep tube center pan, 10-inches across; or 2 pans 7-1/2 inches across by 3-1/2 inches deep. 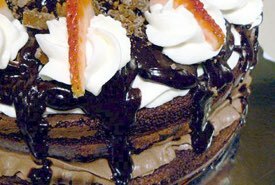 To make white Angel Food Layer Cake — split to make 2 layers. Place almond cream filling between layers and cover cake with white seven minute icing (recipe below). 1/4 pound blanched and toasted almonds, chopped. Mix sugar, cornstarch, and salt. Add milk and cook 5 minutes, stirring constantly. Add slowly, slightly beaten egg yolks and cook in double boiler until thick and creamy, add nuts and vanilla and cool before spreading between layers of angel cake. Place first 5 ingredients in saucepan, set in pan of hot water over low heat. Beat continuously for 7 minutes. Remove from heat, add flavoring and beat well. When cool spread over cake. Dissolve gelatin in 1-1/4 cups boiling water. Stir in thawed strawberries, sugar, and salt. Cool until it begins to thicken. Fold in the cream, whipped. Cover bottom of 9-inch pan with half of the torn angel cake, pour over half of the strawberry and cream mixture, add another layer of cake and repeat strawberry and cream mixture. Refrigerate 4 to 5 hours until firm before serving. Mix and sift the first four ingredients four times. Add gradually, the scalded milk. Fold in whites of eggs, beaten until stiff, and add the vanilla. 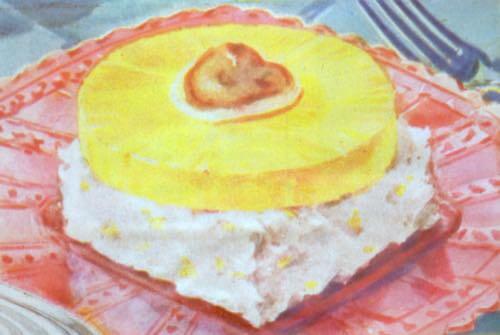 Turn into an unbuttered angel cake pan and bake in a moderate oven (350°F) 45 minutes, or until done. 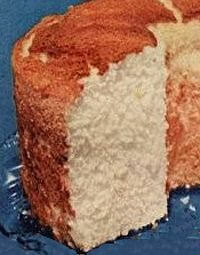 Bake your cake following instructions in the homemade angel food cake recipes. After removing your baked cake from the hot oven, rest the rim of the inverted cake pan over two or three glasses, until the cake has fully cooled. Suspending it upside-down while cooling will prevent it from falling back on itself. 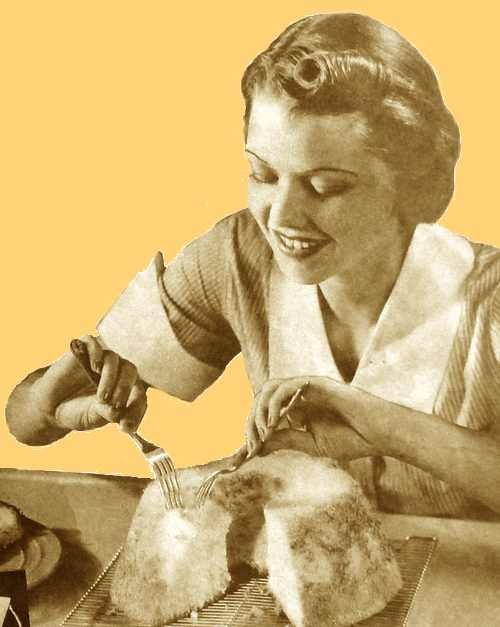 Next, carefully loosen the completely cooled cake with a knife as shown, then invert the pan and sharply tap its rim on the a hard surface to dislodge it from the pan. Your cake is ready for decorating. 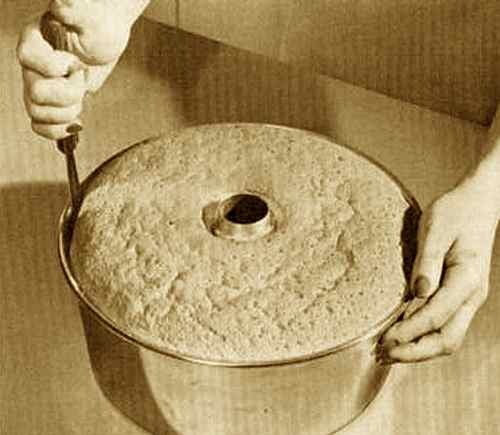 If you would like additional instructions for making angel food cakes, Click Here and follow along as a Pennsylvania German housewife shares how she bakes hers from scratch in the 1800s. It's a cooking lesson wrapped in a delightful story. 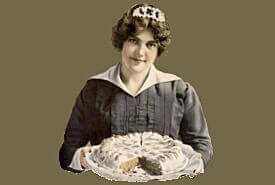 Here's a great vintage dessert idea. Imagine generous slices of homemade angel food cake covered with rich butter icing containing crushed pineapple and topped with a glistening pineapple slice. Absolutely delicious!